An up close, mouth-watering view of the caramel espresso buttercream, smashed Heath bars, and coffee salt exterior. There are a lot of things in life that are harder than we think they’ll be. In our younger years, that’s often school related. Assignments, tests, finals, etc. As we get older, that changes to landing jobs, perhaps finding our ideal match, making big decisions. But thankfully, to balance that out, we sometimes encounter things that are easier than we anticipated. After hearing no small amount of horror stories from other parents, I had great dread about the beginning of my kids’ dating years. With my son being 3 years older than my daughter, unless he would be a late bloomer, I knew he’d likely be first at bat. And oh the angst! Owen has always been the sweetest boy–incredibly thoughtful and connected to us, he can sense a shift in the emotional or psychological temperature of the room. And when he feels things going South for someone he cares about, he does tiny, subtle things to connect–maybe a smile or a look, a comment, or a gentle karate chop–a playful thing we do in our family– to sort of say–hey–I feel it too and you’re not alone. I’m with you. Little things like this are just one of the many, many things about Owen that endear him to our hearts in a deeply special way. So the idea of a girlfriend coming on the scene–GASP–oh my. You can imagine the latent anxiety. Would she change him, would she change us, would she find all the crazy quirks in our family, the very things that tie us together, annoying and dumb? Would she hog all of his bandwidth and disengage him from our family? Stuck between to the determination to be supportive and the fear that this stage of his life would begin a permanent change in our family, we waited. And then Kirsten arrived. She had his eye from the start. I remember him telling me that he liked her–the first girl he admitted to “liking”– in middle school. And they started dating, whatever that means in middle school, but it was not for long. Because, well hello, it’s middle school. But they would try again in high school and this time it would be more successful. After knowing Kirsten for over a year now, I totally get his fascination. She is a genuinely kind person, actively concerned about and engaged with the people around her. Still, she is no one’s doormat—you can sense a fine, strong spine through her kindness. She has a mind that can form strong opinions and she’s not afraid to share them, but she also knows how not to be obnoxious about it. She has a quirky sense of humor, something that’s incredibly helpful if you’re going to spend any amount of time with our family. She has her own sense of style and being that are decidedly and happily not “mainstream”. And not to be overlooked, she is an extremely creative, talented artist who is wonderfully skilled with many mediums, most especially illustration. 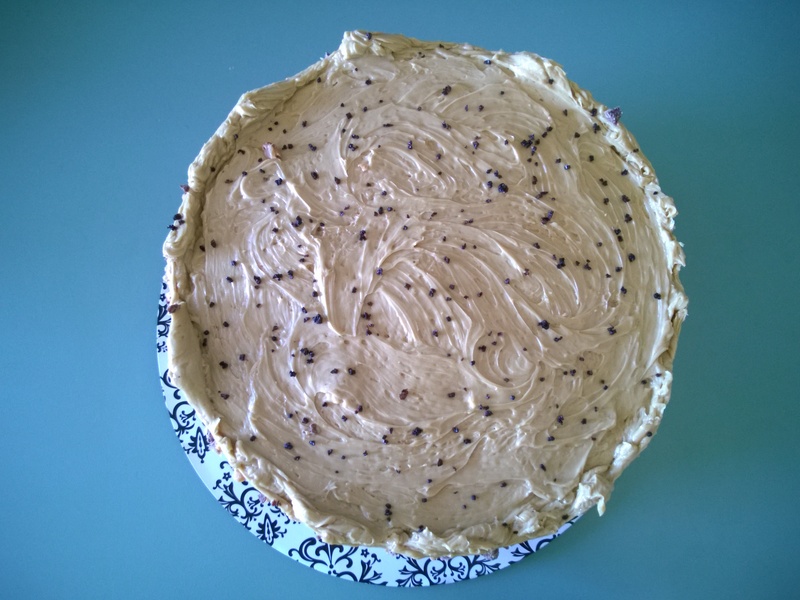 Savory coffee salt pleasantly counterbalances the sweetness of the caramel espresso buttercream. All of these traits make her an ideal fit for Owen—who indeed is very similar. And wouldn’t you know, they also make her an ideal fit for our family. So after all the fretting and dread about what was surely the impending “loss” of our son, he has found someone who not only hasn’t removed him from our family, but become part of ours. Hooray for the things in life that are easier than we thought they’d be, right? Today’s cake was Kirsten’s special request. 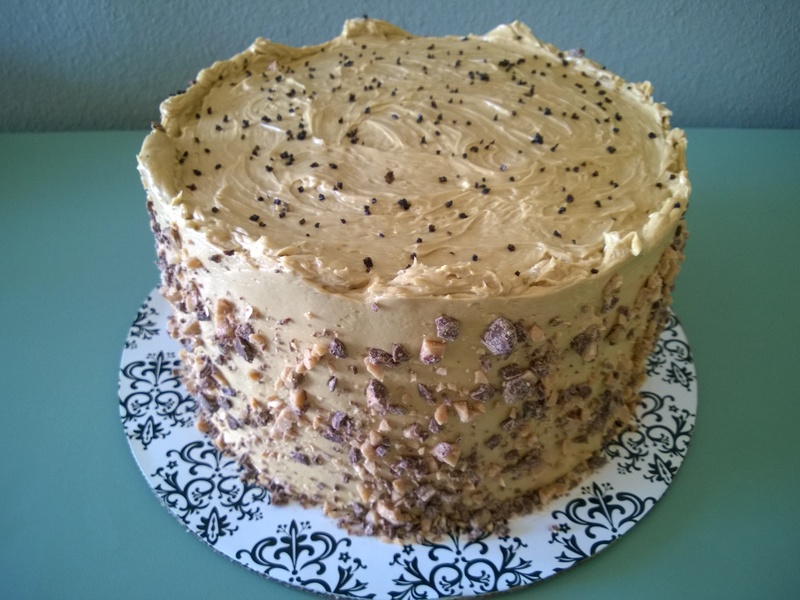 Having tasted samples of many different components of many different cakes, when her birthday rolled around, it seemed to be an easy decision: chocolate cake filled with dual layers of caramel espresso buttercream and salted caramel, then frosted with the caramel espresso buttercream and accented with smashed Heath bars and coffee salt. A cake composed of easy, familiar, yet sophisticated flavors. It was a pleasure to make this sweet cake so well suited for such a sweet person—happy birthday, Kirsten! 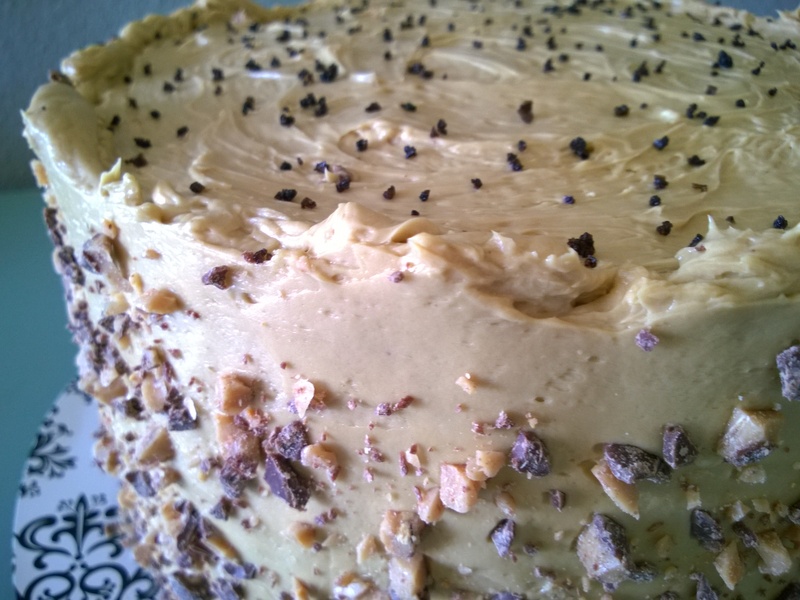 Moist chocolate cake is filled with layers of caramel espresso buttercream and salted caramel, then frosted with the caramel espresso buttercream, and accented with smashed Heath bars and coffee salt.